Evidence-based medicine (EBM) has been advocated as a new paradigm in orthodox medicine and as a methodology for natural medicines, which are often accused of lacking an adequate scientific basis. 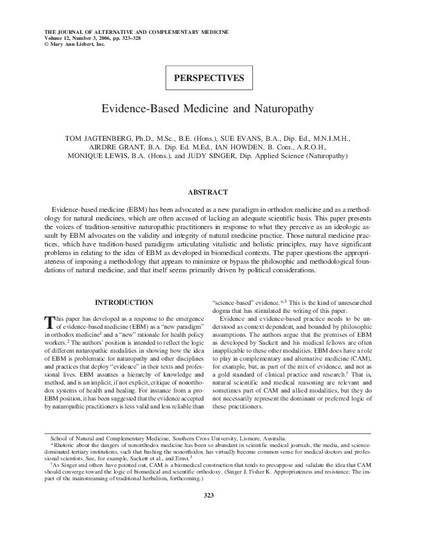 This paper presents the voices of tradition-sensitive naturopathic practitioners in response to what they perceive as an ideologic assault by EBM advocates on the validity and integrity of natural medicine practice. Those natural medicine practices, which have tradition-based paradigms articulating vitalistic and holistic principles, may have significant problems in relating to the idea of EBM as developed in biomedical contexts. The paper questions the appropriateness of imposing a methodology that appears to minimize or bypass the philosophic and methodological foundations of natural medicine, and that itself seems primarily driven by political considerations. Jagtenberg, T, Evans, S, Grant, A, Howden, I, Lewis, M & Singer, J, 2006, 'Evidence-based medicine and naturopathy', Journal of Alternative and Complementary Medicine, vol. 12, no. 3, pp. 323-328.